I had a couple of cans of coconut milk and a whole, fresh, ripe pineapple just staring me down. Watching me. Harassing me. Taunting me. I was in the mood for something sweet and J-Wiz has been asking me for rice pudding. So duh. I put the tropical influence from the coconut milk and pineapple along with a classic rice pudding and wa-la! An amazing easy-to-make dessert that will, simply, make you happy. Well, it made us happy. Plain and simple. In a large pot, combine the first five ingredients. Simmer on medium-low, uncovered, for about 40-45 minutes. Stir occasionally. The starch in the rice helps it thicken up nicely. After it’s thickened, but still a little soupy, tempur the egg yolks in. Tempur means to whisk in some of the hot pudding mixture into the egg (about 1/4 cup). Then add the egg yolk mixture back into the pot and stir in the vanilla extract. Simmer for about a minute more while continuing to stir. It should be thick and creamy now. Pour the pudding in a dish, cover and refrigerate for at least 3 hours. – 2 cups of fresh pineapple, diced **Don’t use the core of the pineapple. It’s very fiberous and won’t cook soft. But don’t throw it away! It’s very nutritious! Just a little crunchy! 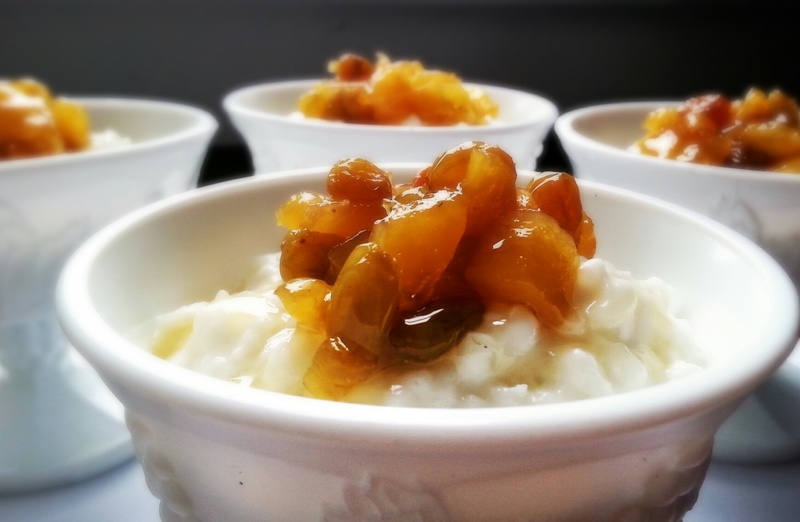 This compote is just as easy to make as the pudding was. Throw everything, EXCEPT FOR THE HONEY, in a medium-sized saucepan. On high heat, bring to a boil. Lower heat to medium and cook uncovered for about 30 minutes. The pineapple should be soft. Using a slotted spoon, transfer the pineapple and raisins into a bowl and set aside. Add the honey to the liquid in the pot and bring to a high simmer until it reduces to a syrup. About 15-20 minutes. Once the syrup has thickened, pour back over the pineapple and raisins. Cover container and chill until you’re ready to serve. This desert is so amazing! It’s the perfect desert to make ahead of time during the holidays, before a dinner party or just anytime! It’s best after chilling all night in the refrigerator. 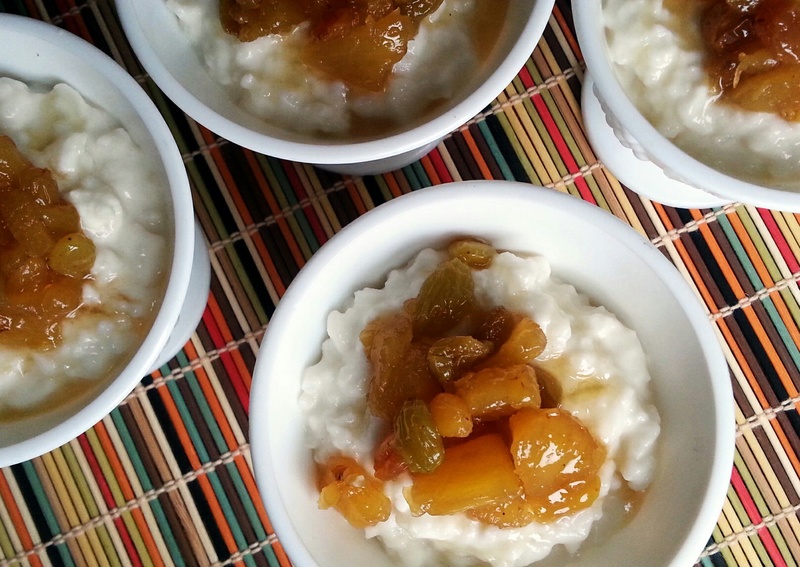 This entry was posted in Food, Holiday cooking, Munchies, Recipes, Sweet Tooth and tagged coconut milk, coconut rice pudding, compote, golden raisins, honey, pineapple, rice, rice pudding, ripe pineapple, spiced rum. Bookmark the permalink. Rice pudding is the BEST! I love making it. Try the coconut milk! Amazing!